A spacecraft operated by NASA has become the first of its kind to achieve orbit around a dwarf planet, the agency confirms. NASA said on Friday that mission control in California learned at around 5:36 a.m. PST that the Dawn spacecraft had settled into orbit as expected around Ceres, a mini-planet between Mars and Jupiter. "Downlink has begun! 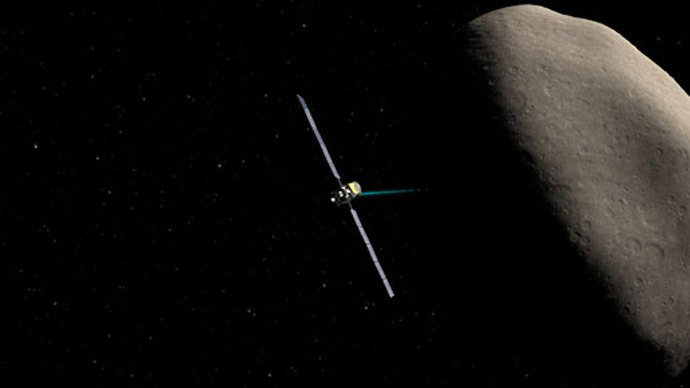 We're analyzing the signal to confirm that the spacecraft is healthy and in orbit at #Ceres," NASA's Jet Propulsion Laboratory announced on Twitter. "Since its discovery in 1801, Ceres was known as a planet, then an asteroid and later a dwarf planet," JPL mission director Marc Rayman, the chief engineer of Dawn, said in a statement. "Now, after a journey of 3.1 billion miles (4.9 billion kilometers) and 7.5 years, Dawn calls Ceres, home." Relatively speaking, of course—according to the BCC, JPL project manager Robert Mase said Dawn will still be tens of thousands of miles away from Ceres at any time, but still closer than the Earth is to its own moon—and close enough to collect data. "Over the next month, we'll re-shape the orbit and get ready to begin the prime science phase,” Mase said. “We have much to do over the next year and a half, but we are now on station with ample reserves, and a robust plan to obtain our science objectives,” Russell said. Indeed, NASA has never before sent a spacecraft of any sort to Ceres, making the start of the Dawn mission a critical step to understand what Russell described as Earth’s “secretive neighbor” when he spoke about his team’s efforts to USA Today. "This is a first reconnaissance of an entirely new world,” explained Rayman, the chief engineer. "Everything we're seeing was unexpected,” added Russell. Ceres is roughly 4.5 billion years old, but was only discovered a little more than 200 years ago. Scientists now hope to learn more about the dwarf planet than ever before through its latest probe, and from there can make determinations about other oddities within the solar system.